Posted by Lacey Hagler on Friday, October 12th, 2018 at 10:49am. Offshore, football-sized blackfin tuna have been pretty easy to get ahold of in about 200-400’ of water. You can use small daisy chains or troll with feathers, but quite a few have been caught trolling with small-skirted bonita strips as well. We had a lot of success with neon green and white skirts this week, but colors are a game that changes by the minute, so try a few different ones and switch the rest out as you go if your target fish is tending to a particular color. Dolphin have been in the same areas as blackfin, and wahoo have been non-existent. On the first cold front that rolls through, we’ll have our local favorite Junkanoo Lures ready. Regardless of our lack of cold fronts, sailfish have been eating live goggle eyes and blue runners. If you head out kite fishing, don’t be surprised if you get a double. 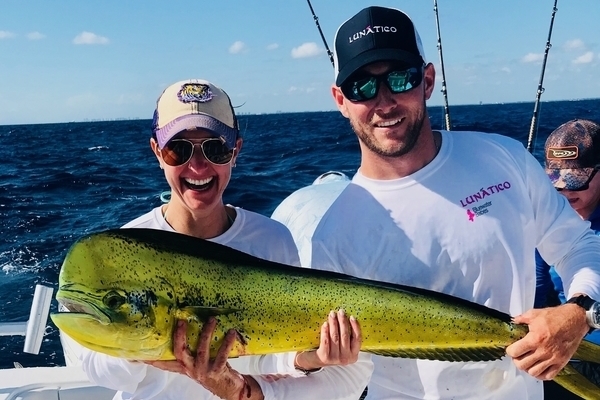 Kingfish and pretty large mutton snapper have been eating sardines near 120 – 200’, and yellowtail snapper has been showing up in strong numbers. Considering the calm conditions this and snapper bite, bottom fishing will probably be pretty fun this weekend, or it’s a good time for a Bahamas trip! Inshore, the mullet are still running near shore, through the intracoastal, and near inlets, and snook, jacks, tarpon, ladyfish, and redfish aren’t far behind them. Using live mullet near sunrise or sunset near structures where water is moving through and you’ve seen schools churning almost guarantees a bite. Post up near bridges, at Juno Pier, or the Jupiter jetty. Top water plugs are also a viable option. The friendly guys at Juno Bait Shop should be able to fix you up with some good lures if you don’t want to mess with keeping bait alive. The Juno Beach pier and the beach has been going off, probably due to the surf kicking up. Lots of bluefish, Spanish mackerel, jacks, runners, pompano, jacks, and redfish have been caught one after another. Juno Bait recommends a Rapala X-Rap or Yo-Zuri Mag Darter for some solid action. If you're thinking of heading to the Bahamas, read "How to Cross From Florida to the Bahamas By Boat". Friday, 10/12: Partly Sunny with a 40% chance of thunderstorms, High of 87 degrees, West winds at 5-10 knots, 2’ seas at 4 second periods, Intracoastal waters a light chop. Saturday, 10/13: Mostly Sunny with a 30% chance of thunderstorms, High of 87 degrees, West Northwest winds at 5 knots, 2’ seas at 3 second periods, Intracoastal waters a light chop. Sunday, 10/14: Party Sunny with a 40% chance of thunderstorms, High of 87 degrees, East winds at 5-10 knots, seas 2’ at 3 second periods, Intracoastal waters a light chop.